Increasing depth of deep learning networks necessitate the need for novel mechanisms to improve performance on GPUs. One mechanism to achieve higher efficiency is to fuse separate kernels into a single kernel to reduce off-chip memory access and avoid kernel launch overhead. This document outlines the addition of a Fusion API to the MIOpen library. The fusion API would allow users to specify operators that they wants to fuse in a single kernel, compile it and then launch the kernel. While not all combinations might be supported by the library, the API is flexible enough to allow the specification of many operations in any order from a finite set of supported operations. The API provides a mechanism to report unsupported combinations. A complete example of the Fusion API in the context of MIOpen is given here. We will use code from the example project as we go along. The example project creates a fusion plan to merge the convolution, bias and activation operations. For a list of supported fusion operations and associated constraints please refer to the Supported Fusions section. The example depicts bare-bones code without any error checking or even populating the tensors with meaningful data in the interest of simplicity. The above steps assume that an MIOpen handle object has already been initialized. Moreover, the order in which operators are created is important, since it represents the order of operations on the data itself. Therefore a fusion plan with convolution created before activation is a different fusion plan as opposed to if activation was added before convolution. The following sections further elaborate the above steps as well as give code examples to make these ideas concrete. The primary consumers of the fusion API are high level frameworks such as TensorFlow/XLA or PyTorch etc. A Fusion Plan is the data structure which holds all the metadata about the users fusion intent as well as logic to Compile and Execute a fusion plan. As mentioned earlier, a fusion plan holds the order in which different opertions would be applied on the data, but it also specifies the axis of fusion as well. Currently only vertical (sequential) fusions are supported implying the flow of data between operations is sequential. Where fusePlanDesc is an object of type miopenFusionPlanDescriptor_t and input.desc is the miopenTensorDescriptor_t object. 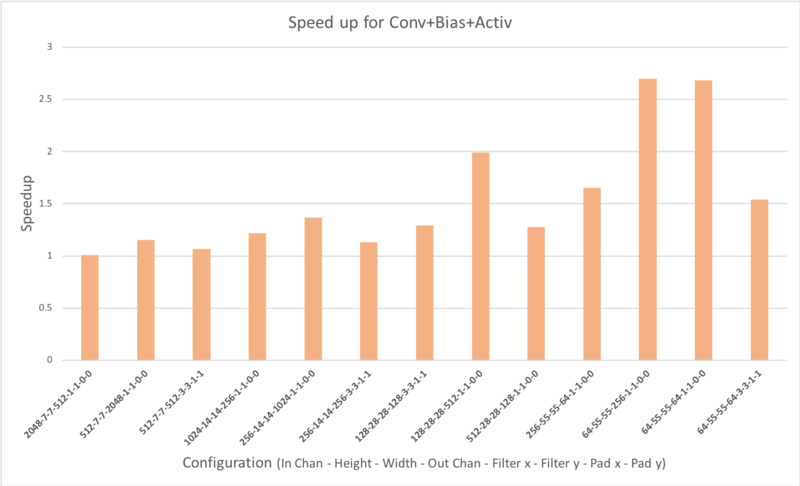 Notice that Bias is a separate operator, although it is typically only used with convolution. This list is expected to grow as support for more operators is added to the API, moreover, operators for backward passes are in the works as well. It may be noted that conv_desc is the regular MIOpen Convolution descriptor and is created in the standard way before it is referenced here. For more details on creating and setting the convolution descriptor please refer to the example code as well as the MIOpen documentation. In the above snippet weights.desc refers to the miopenTensorDescriptor_t for the convolution operations and bias.desc refers to the object of the same type for the bias operation. The order of insertion of operators indicates the order in which the operations would be performed on the data. Therefore, the above code implies that the convolution operation would be the first operation to execute on the incoming data, followed by the bias and activation operations. During this process, it is important that the returned codes be checked to make sure that the operations as well as their order is supported. The operator insertion might fail for a number of reasons such as unsupported sequence of operations, unsupported dimensions of the input or in case of convolution unsupported dimensions for the filters. In the above example, these aspects are ignored for the sake of simplicity. In order to compile the fusion plan, the user is assumed to have acquired an MIOpen handle object, in the example code above this is accomplished using the mio::handle() helper function. While a fusion plan itself is not bound to a MIOpen handle object, it would however need to be recompiled for each handle separately. It may be noted that compilation of a fusion plan might fail for a number of reasons, moreover it is not assured that a fused version of the kernel would offer any performance improvement over the separately run kernels. Compiling a fusion plan is a costly operation in terms of run-time. Therefore, it is recommended that a fusion plan should only be compiled once and may be reused for execution with different runtime parameters as described in the next section. This separation between the fusion plan and the arguments required by each operator allows better reuse of the fusion plan with different argument as well as avoids the necessity of recompiling the fusion plan to run the same combination of operators with different arguments. As mentioned in the section Compile the Fusion Plan earlier, the compilation step for a fusion plan might be costly, therefore a fusion plan should only be compiled once in its lifetime. A fusion plan needs not be recompiled if the input desciptor or any of the parameters to the miopenCreateOp* API calls are different, otherwise a compiled fusion plan may be reused again and again with a different set of arguments. In our example this is demonstrated in lines 77 - 85 of main.cpp. Once the fusion plan has been compiled and arguments set for each operator, it may be executed with the API call given below passing it the actual data to be processed. It may be noted that it is an error to attempt to execute a fusion plan that is either not compiled or has been invalidated by changing the input tensor descriptor or any of the operation parameters. Once the fusion plan object is destroyed, all the operations created are destroyed automatically and do not need any special cleanup. *N mode is either spatial, or per activation. For CBA other asymmetric kernels are supported as well, but are not enumerated here for brevity. *N mode is either spatial, or per activation.